(2 Customer Reviews) | Write Review 12 issues per year The practical monthly magazine for women who take a hands-on approach to decorating, revamping and styling their home. 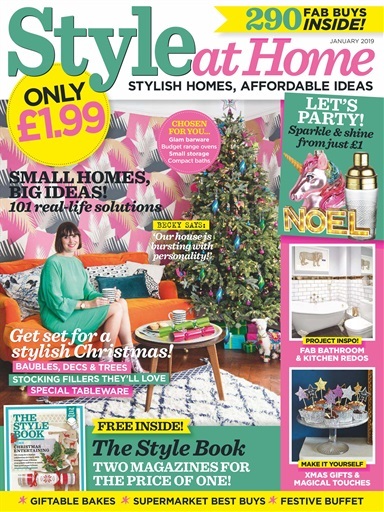 Every issue contains inspiring real homes, projects, finishing touches, great-value shopping and affordable style ideas. Plus a special pullout ‘Cook it’ section each issue, with 50+ quick and easy recipes. This month we provide one hundred real life solutions. So get set for a stylish Christmas as we feature seasonal room schemes your guests will love so much, they won’t want to leave. The practical monthly magazine for women who take a hands-on approach to decorating, revamping and styling their home. Every issue contains inspiring real homes, projects, finishing touches, great-value shopping and affordable style ideas. Plus a special pullout ‘Cook it’ section each issue, with 50+ quick and easy recipes. 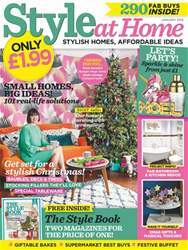 You'll receive 12 issues during a 1 year Style at Home magazine subscription. I was introduced to this magazine when I bought my first house five years ago and have been hooked ever since! Fantastic magazine full of ideas and tips on where to buy things for your home. For me a must buy, just wonderful! I just had to buy this mag among with Home Style and Your Home every single month during my UK stay! All 3 mags are good value for money and what's most important absolutely beautiful! The best deco, the best highstreet buys, love love love! I was so excited every month awaiting the next issue! You'll receive 12 issues during a 1 year Style at Home magazine print subscription.